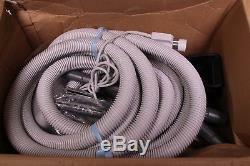 Honeywell Central Vacuum H100 30 ft HV Hose Set with Attachments and Power Head. Crushproof hose with a 3-position switch on the handle. This controls power to the powerhead as well as the central vacuum unit. The hose handle swivels 360 degrees for strain free maneuverability. Barefloor Brush to clean smooth floors. This brush can grab dirt from grouted tiles and the swivel design makes cleaning under furniture convenient and easy. The lightweight design and gentle operation allow you to use this brush on throw rugs without clogging the hose. Telescopic Wand for use with the powerhead. Telescopic Wand for use with the barefloor brush and other attachments. Dusting Brush with natural, 1 1/2 long bristles, making this tool perfect for dusting table tops and bookshelves. Tool Caddy so you can bring your attachments with you while you clean. 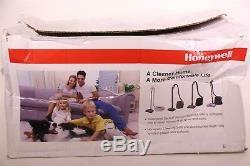 The Honeywell Starter Cleaning Set also includes a Starter Powerbrush. Incandescent Headlight to make vacuuming in low lighting more convenient. Large rear rubber wheels to prevent marring of hard surface flooring. Locking neck with a foot release lever to quick wand release. Floating head with self-adjusting height control to allow easy accommodation for different levels of flooring. Powered by SixBit's eCommerce Solution. The item "Honeywell Central Vacuum H100 30 ft HV Hose Set with Attachments and Power Head" is in sale since Friday, June 8, 2018. 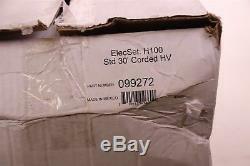 This item is in the category "Home & Garden\Household Supplies & Cleaning\Vacuum Parts & Accessories".
" and is located in Alpharetta, Georgia. This item can be shipped to United States, Canada, United Kingdom, Denmark, Romania, Slovakia, Bulgaria, Czech republic, Finland, Hungary, Latvia, Lithuania, Malta, Estonia, Australia, Greece, Portugal, Cyprus, Slovenia, Japan, Sweden, South Korea, Indonesia, Taiwan, Thailand, Belgium, France, Hong Kong, Ireland, Netherlands, Poland, Spain, Italy, Germany, Austria, Israel, Mexico, New Zealand, Philippines, Singapore, Switzerland, Norway, Saudi arabia, Ukraine, United arab emirates, Qatar, Kuwait, Bahrain, Croatia, Malaysia, Brazil, Chile, Colombia, Costa rica, Dominican republic, Panama, Trinidad and tobago, Guatemala, El salvador, Honduras, Jamaica.